AFP: - Japan's cash-strapped government is turning to wildly popular music group AKB48 to help it sell government bonds, as interest in the low-yield paper wanes, reports said Friday. The all-female pop group will headline a summer campaign for "reconstruction bonds" aimed at financing projects in regions hammered by last year's quake-tsunami disaster, the Wall Street Journal said, citing an unnamed source. AKB48, one of the world's highest-grossing acts with more than $200 million in CD and DVD sales last year, are a phenomenon in Japan and across Asia, with members appearing in commercials for everything from chocolate to mobile phones. The debt campaign will see AKB48 -- comprising about 90 performers, ranging in age from early teens to mid-20s -- joined by sumo wrestling's champion Hakuho and female football star Homare Sawa, Japan's Jiji press agency reported. See a more "colorful" version of this story from the Telegraph. Buying government paper is being portrayed as a patriotic thing to do. These types of campaigns to push JGBs to Japan's population have been common in recent years. But with some 95% of bonds owned domestically and a rapidly aging population, selling long-term paper at yields of 90bp will become increasingly difficult - no matter how many girl bands or sumo wrestlers the government hires. Some would argue that the central bank (BoJ) with its unlimited supply of yen can always step in and buy the government's massive amounts of rolling and new debt. 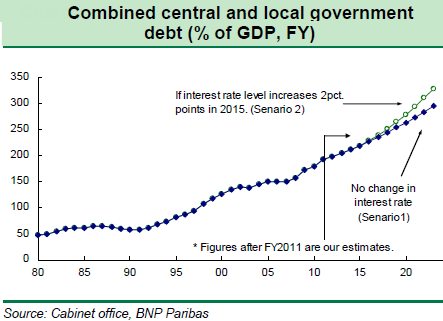 That is Japan's Debt to GDP ratio can grow indefinitely. The rating agencies have simply been wrong to sound the alarm. And because Japan has been in a deflationary environment, printing more yen will do the nation some good. In fact BoJ has been doing just that. 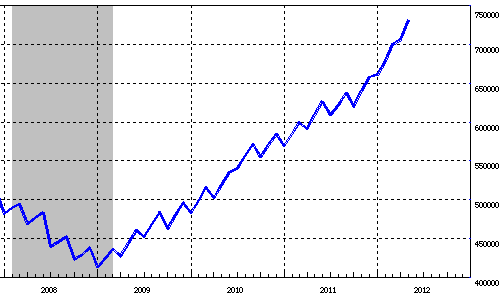 The central bank has been engaged in a "perpetual QE" since the 2008 financial crisis. And that program has been accelerated this year, keeping long-term rates low. Apparently that's not enough, as the governmental needs to sell more paper - above and beyond what the central bank, insurance firms, banks, pensions, and corporations have been buying. Clearly there is the reconstruction effort, after which the needs to sell large amounts of JGBs should subside. Or maybe not. Debt to GDP ratio is expected to continue climbing at its current pace, exceeding 250% within the next few years. And that's assuming no change in interest rates. Should rates increase, the ratio's growth will begin to accelerate because the government would need to cover ever larger interest expenses.